Does anyone know how the Over Credit Limit warnings are calculated? Meaning, what is used to calculate the currently used portion of the Customer's Credit Limit? Does NAV look at the Customer's Balance, the Customer's Balance plus Open Orders, the Customer's Balance plus Shipped Not Invoiced? We are using NAV 2017. Thanks! 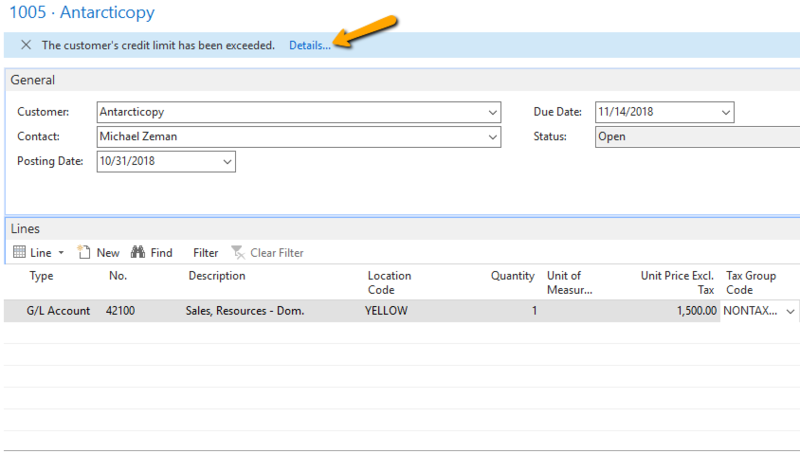 If you allow the notification warning to occur, click on the Notification Details.... the page that opens shows you a list of amounts with balances used to determine the credit limit has been exceeded. Screenshots are from NAV 2017. Balance is sum of open customer ledger entries (you can drill into them from here. A great tool if a CSR is on the phone with a customer when they get this warning.) 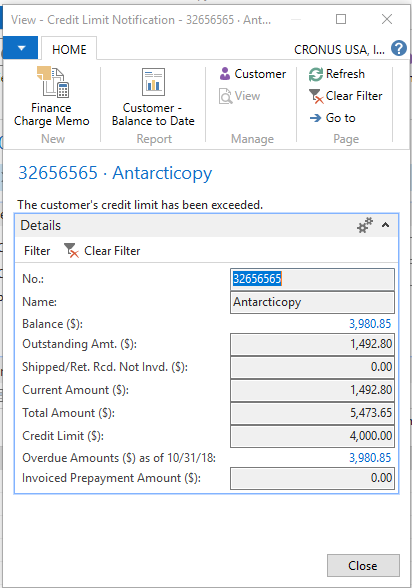 The Outstanding Amount comes from sales lines where the document type is order or invoice (the document does not need to be released however if released it will not be shipped and/or invoiced.) Next is a line showing amount shipped not invoiced. None of these seem to consider Blanket Orders or Credit Memos (posted or unposted.) Current, Total and Credit Limit as self explantory. This page also shows prepayments. I did not test how, if at all, prepayments will affect the limit calculation. If you use these, you can test this out. This was a great question and a fun one to figure out for you. Hope this helps. I learned something today!